Most of us make an effort to hold down our electric bill by turning off unnecessary lights and unwatched televisions, adjusting the thermostat to conserve energy used for heating or cooling, dialing down the electric water heater to no more than a 130 degree setting, and by using appliances as efficiently as possible. However, while we may strive to save on our electric bill, we are all occasionally guilty of wasting those savings by running too much hot water while rinsing dishes or showering. And while we may switch off a light in an empty room, we sometimes stand for minutes in front of an open refrigerator door, contemplating a snack. The point is, saving money on your use of electricity requires common sense, constant effort, and a good memory. Another way you can control the cost of your electricity is by participating in our Peak Alert Program. Peak demand usually occurs in the summer during extremely hot days between 2 and 7 p.m.
A winter peak usually occurs on extremely cold winter days between 5 and 10 a.m. and 5 and 8 p.m. The reason Peak Alert makes sense is simple. Since electricity can't be stored, it must be produced on demand, when you turn on an appliance. Generating this much electricity during peak demand periods requires the use of additional generators, which are more costly to operate. This means it costs more to produce energy that you use during peak periods. And since the cost that your cooperative pays for electricity rises every time the cooperative establishes a new peak, a small effort by many cooperative members can make a big difference. Peak Alert is used only when absolutely necessary to reduce demand charges. It doesn't mean that we're running out of electricity; it simply means we're striving to save cooperative members money. When we anticipate a peak is about to occur, we'll make Peak Alert announcements on area radio stations. 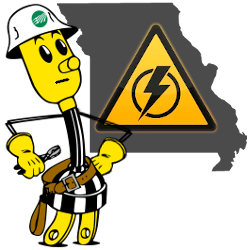 When you hear a Peak Alert announcement, we ask that you limit your use to one major electrical appliance at a time, and turn off any lights, televisions, or small appliances not in use. Your cooperation and the cooperation of your friends and neighbors is very important. Remember, every little bit counts... the money you save will be your own.